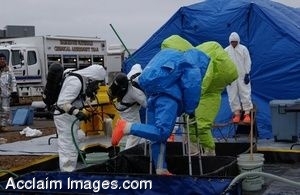 Description: Clipart Photograph of U.S. Air Force Airmen practice decontamination procedures during a hazardous material (HAZMAT) technician training exercise conducted at the Air National Guard base in Duluth, Minn., Oct. 18, 2006. The exercise, in coordination with the Duluth Fire Department, is one requirement to certify 148th Fighter Wing members to respond and mitigate HAZMAT incidents. (U.S. Air Force photo by Staff Sergeant Jason W. Rolfe). Clip art photograph by Department of Defense Public Domain.